Demolition Cleanup, Boone, NC | Double D Construction Services, Inc. Demolition Cleanup, Boone, NC | Double D Construction Services, Inc.
Let us take over the less exciting part of demolition: the demolition cleanup! The demolition process can be great fun to watch! Everyone from young children to adults can enjoy watching a building come down neatly with controlled explosions or simply torn down with a few swipes of a backhoe. Once the demolition is completed, however, the fun tends to stop. Now the demolition cleanup needs to be done and it is neither fun to watch or participate in. It also takes much longer to clean the debris away than it did to perform the demolition. 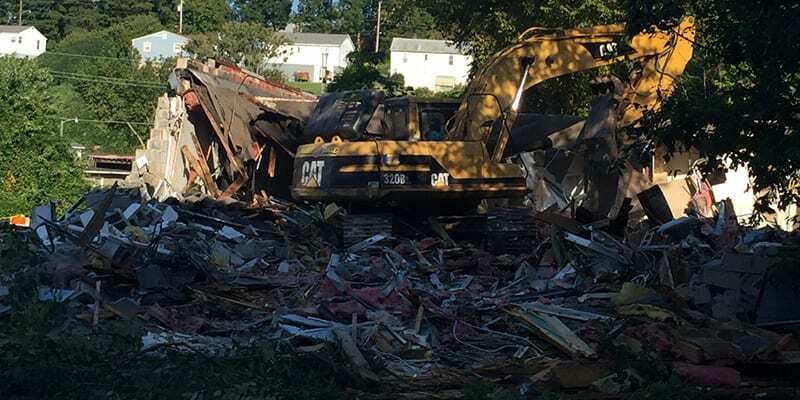 When you want to start fresh after a demolition with a clean property or a plot of land ready for planting, our team here at Double D Construction Services, Inc. is here to help you with your demolition cleanup needs. Unlike many other demolition cleanup services in and around the area of Boone, North Carolina, when we say that we will clear the demolition site, we mean it! We remove all the larger pieces of debris and the tiny ones as well. We can level the ground for a fresh new start and, if desired, we will seed & straw the area for new grass growth to come in. We understand that demolition cleanup isn’t the most enjoyable task in your repertoire, so we use our practiced skills in demolition cleanup to take this dreaded task off your to-do list. Here at Double D Construction Services, Inc., we have many different services, including demolition cleanup, that we can help you with. If you would like to know more about our services such as demolition cleanup, please let us know. We would be happy to help. At Double D Construction Services, Inc., we offer demolition cleanup services in Winston-Salem, Greensboro, Boone, Charlotte, and Hickory, North Carolina.